WAS THE MEDIEVAL PERIOD PARTICULARLY DEVOUT? In that long succession of centuries we call the Middle Ages, even if we consider only their highest point, in the twelfth, thirteenth and fourteenth centuries, we are struck by how much the discipline of ideas is but apparent, and that we are confronted by a vast and intense process of fermentation. In the bosom of that Christian civilisation, what revolt, what sensuality, what unbelief! Heresies were not, as is commonly believed, only inspired by the need for intellectual liberty, but also by a horror of moral fear, by survivals of ancient paganism. Did not a commentator on Dante assert that in Tuscany in the twelfth century, over one hundred thousand men of noble station thought like Farinata Degli Uberti and Epicurus that paradise should be sought in this world only? When, as Bocaccio said, one saw Guido Cavalcanti pass by, all a-dreaming in the streets of Florence, people said that he was imagining he could prove that God does not exist. We don't take sufficient account of the fact that it was Boccacio's "curés" who had their churches decorated by "Giottesques," and that these devout images, whose power for edification is as yet unexhausted, those moving "Pietàs," those pure "Madonnas," were painted not by pious artists in the mould of Rio or of Montalembert, but by one of those free sensualists; believers, certainly, but not at all mystical - Buffamalco as described by Bocaccio and Sachetti (5) was only the most original and highly developed example. (5) Buonamico Buffalmaco, early fourteenth century painter whose antics as a practical joker are described in Bocaccio's Decameron and in Franco Sacchetti's Il trecentonovelle. Sacchetti - c1335-c1400 -was a poet but best known as author of humorous short stories. Vasari said of Perugino that he was without religion, and that it was never possible to bring him to belief in the immortality of the soul. 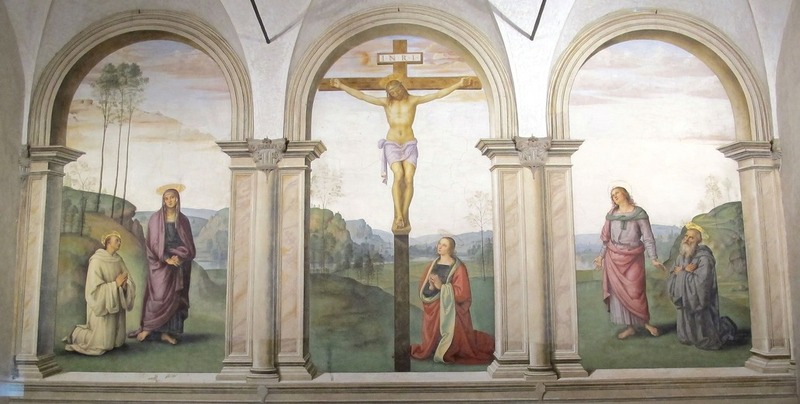 Nevertheless there is a Deposition from the Cross by him at the Pitti and a fresco at Nostra Signora de 'Pazzi which bear an intense religious emotion surpassing by far any sentiments which the works of père Besson, that Dominican painter of Lacordaire's entourage, might arouse in us or those of Overbeck or of Hyppolite Flandrin, three men whose spirit of faith and personal piety are known to us. Assuredly, none of these would have allowed himself, in the latter half of the 19th century, the "pranks" of the sort which Sachetti recounts, one of which, attributed to Giotto, is highly irreverent toward St. Joseph. We are nonetheless agreed that the vault of the lower church at Assisi or the Deposition in the Tomb at the Arena of Padua are of a quality of mystical expression far superior to that of the disciples of Ingres. We know little about the old artists who left traces in our cathedrals - albeit not very many -of a somewhat libertine imagination, but the biographical information which we possess on the Italian primitives certifies that it would be a mistake to categorise as mystics all the artists of the Middle Ages. And whereas, on the other hand, we cannot doubt, nothing allows us to doubt, the religious fervour of a Carlo Dolci or of a Rubens, we might be permitted the conclusion that, no more than theological culture, personal faith is not sufficient to explain the religious superiority of Medieval Art. Pietro Perugino: Crucifixion in the Chapter House, Maria Maddalena de' Pazzi, Florence, c1493-6. Permit me to cite on that point the opinion of St. Thomas. You know how much St. Thomas' philosophy is positive, concrete, Aristotelian. He asks whether art is a virtue, and he defines art simply as the method of creating works, recta ratio factibilium or operum faciendorum. We would say: art is synonymous with craft. And he makes it clear that this definition applies to the liberal arts as well as to the servile and mechanical arts: the liberal arts are more noble, but the definition, he says, applies to both. The notion of art as a sacred ministry had yet to be invented at that time. Thus, St. Thomas asks if art is a virtue and he answers Yes - in this way, that it attains the goal it has set for itself, as the virtue of a knife is to cut, the virtue of a saw is to saw. And he adds: Et ideo ad artem non requitur quod artifex bene operetur sed quod bonum opus faciat - "It is of little consequence whether the geometer is choleric or happy; no matter the disposition of his heart, what counts is that his theorem be true". He nonetheless says that, for man to use art wisely, he must possess that goodwill imparted by moral virtue, and that it is through justice, which makes right his heart, that the artist determines to accomplish a faithful work. Pope Eugene IV gave a good definition of that word "justice" as he dispensed from monastic vows an artist more to be recommended for the beauty of his work than for the mysticism of his life: Fra Filippo Lippi, bad monk and excellent painter, to whom we owe paintings and frescos of admirable religious expression. Moreover, ladies and gentlemen, the fact that religious sentiment was more widespread in the Middle Ages than in our days, would not suffice to persuade me to modify my conclusions. I am now arrived at the subject of collective Faith. People have tried to explain by collective Faith the superiority of Medieval works which served at once as expression of and nourishment for the masses. But they forget that, in the thirteenth and fourteenth centuries, civil architecture and sculpture were not inferior, for example, to the Art of the Cathedrals. Everything finds its way into the temple: mythology, science, history, civil life. The forms which our imagination associates with the catholic ideal were used by municipal pride, corporative, lordly, royal; by the learned, by merchants and the military. There is "nothing sacred," said Ruskin, "in an arch, a vault, in a flying buttress, nor in a pillar. Churches were never built in a particular style, religious, mystical. They were built in the style current in that period." Which authorises us, let it be noted in passing, to hope that Romanesque and Gothic be not forever used to build contemporary churches. But let us return to the Cathedrals.